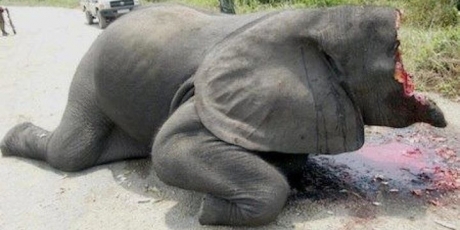 Avaaz - Europe: Stop the elephant slaughter! Europe: Stop the elephant slaughter! Elephants are in crisis, and could be wiped from the earth on our watch. As citizens from around the world we call on you to shut down domestic ivory markets, support a complete ban on the global ivory trade which is fuelling the poaching crisis, and to list all African elephants under Appendix One in the forthcoming CITES classification to afford them the maximum legal protection available, without reservation or exception. Alongside these steps, we are calling for maximum efforts to end the illegal ivory trade. Every 15 minutes an elephant is brutally slaughtered for its tusks, and at this rate they will be gone forever in just a few years. Momentum is growing for a complete, permanent global ban on ivory -- but the European Commission has just come out against it! The elephant crisis is heartbreaking. In some areas these magnificent, sensitive creatures are so terrified of people they only come out at night, and mourning baby elephants refuse to leave the butchered corpses of their mothers. Now 29 African governments have said if Europe gets its way, it will spell extinction for our elephants, and they need our help. A key global summit is just around the corner where we could win the total lasting ban we need, and there are signs powerful countries like France and Germany could lead a rebellion against the EU’s elephant death sentence. African governments will deliver our giant call straight into key meetings to build support for the ban -- sign now to keep our elephants safe, and share with everyone you know.